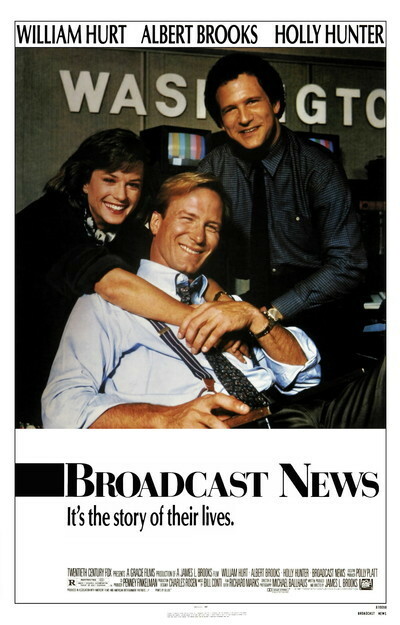 Broadcast News. Amercent Films/Gracie Films/20th Century Fox 1987. This doesn’t have any real reason to, but something about it reminds me of Radioland Murders, Stay Tuned, and Night Court. I doubt it will actually have anything in common with any of them. I keep thinking this has Jeff Daniels, but I think that’s mainly because I’m conflating it with The Newsroom. Aside from those spurious associations, what draws me to this movie? I don’t remember why it was recommended. The television industry of course interests me, and this looks like a typical workplace comedy in that field, otherwise not too remarkable. Additionally, this might be the first time I’ve seen Albert Brooks on screen, though I’ve heard him in Finding Nemo and several times on The Simpsons. Oh. And a few appearances in the early days of Saturday Night Live, I guess. Tom Grunick is a stylish, handsome TV reporter who doesn’t understand the news he’s asked to read, just starting at a Washington, DC network affiliate. Plainer-looking Aaron Altman has been a reporter at the station for years, and is a highly skilled journalist. He’s very close friends with Jane Craig, possibly the best producer in the business, and campaigner for substance over style in journalism. Jane’s journalistic integrity and romantic tension-laden friendship with Aaron are endangered when she finds herself falling in love with Tom even as she resists the changes to the industry he represents. This movie was mis-sold and undersold to me. The drama and commentary far outshine the comedy I was expecting. Hardly anyone but Albert Brooks gets to actually be funny, and he’s hardly just comic relief, channeling some very realistic romantic angst. There’s hardly an angle I can see William Hurt at without thinking of Jeff Daniels or Aaron Eckhart, and not to impugn his acting ability, but his looks were clearly a large factor in his casting. I feel like I should know Holly Hunter, but she’s unfamiliar to me, so to say she disappears into the role doesn’t necessarily sound as complimentary as it should. She owns the newsroom and the role’s vulnerability. The full extent of the symbolism in this film almost escaped me. Obviously, in this story about the conflict between journalistic sizzle and steak, the two reporters from different schools are there to embody those alternatives. But it wasn’t until after I finished watching that I realized that additionally, the love triangle they’re in revolves around a producer struggling to choose between her old friend honest journalism and the new showman she alternates between hating and desperately wanting to get in bed with. The romantic plot directly mirrors the real-world issue being discussed. An issue of a shift that has now happened, and is popularly decried. A shift which Anchorman 2 recently discussed with a lot less nuance and art, though more humor (debatable). But on the surface level, the way the romantic tension was handled was refreshingly candid for the movies. Aaron and Jane are friends, Aaron wants to be more, Jane does not. The stability of their relationship is disrupted by his jealousy over her other relationship, and ultimately the positive resolution is more honest and realistic than the sappier but beloved When Harry met Sally. I’m glad this movie was misrepresented. If I’d known what I was getting into, I wouldn’t have seen it, or at least seen it now. If you’re looking for an angsty romance, or a look behind the curtain at running a newsroom, watch this film. If you’re looking for a disposable romantic comedy, pretend this is one, and watch it anyway.